An iron dragon, really an enormous slide, a lake guarded by Neptune with Venus looking at her reflection, and sun-bathed grass. That's Espanya Industrial Park, where fire, water and earth are the central features. Espanya Industrial extends along a wide esplanade below hilly ground covered with long rows of steps. 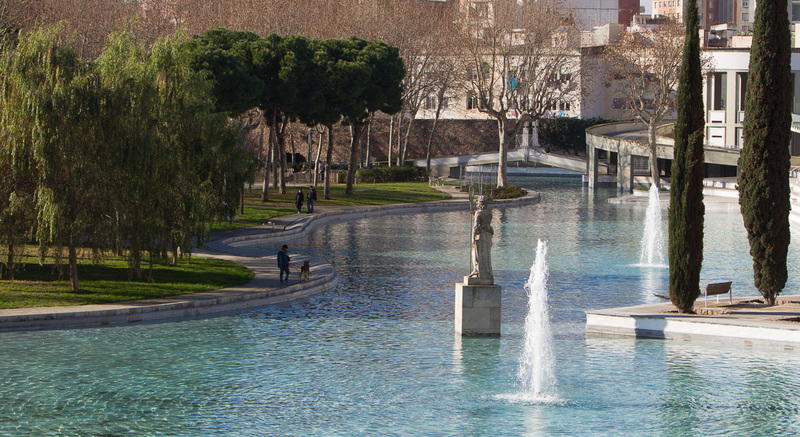 Those at the side of Plaça dels Països Catalans end at the lake which skirts around almost half of this green space. Nine lighthouse towers dominate the top of these steps. The steps here, covered in white tiles, are comfortable enough to sit on and lead down to the small islands with benches out in the lake. The other slope with steps runs parallel to the avenue connecting the park’s main entrance to the other end. On one side of the avenue there is the Espanya Industrial sports centre. This gives access to the large expanse of grass crossed by stone paths that takes up a large part of the park and ends with a small shaded wood. 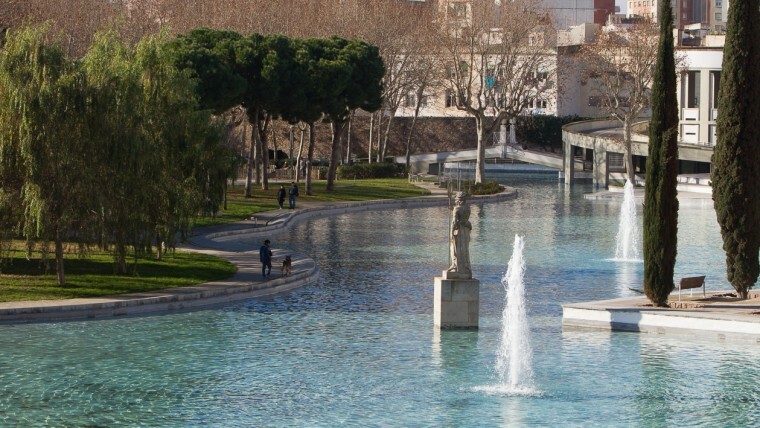 This is an example of the land reclamation started in Barcelona in the 1980s to recover land occupied by services and industries that were either defunct or had moved to other sites in the Barcelona Metropolitan Area. 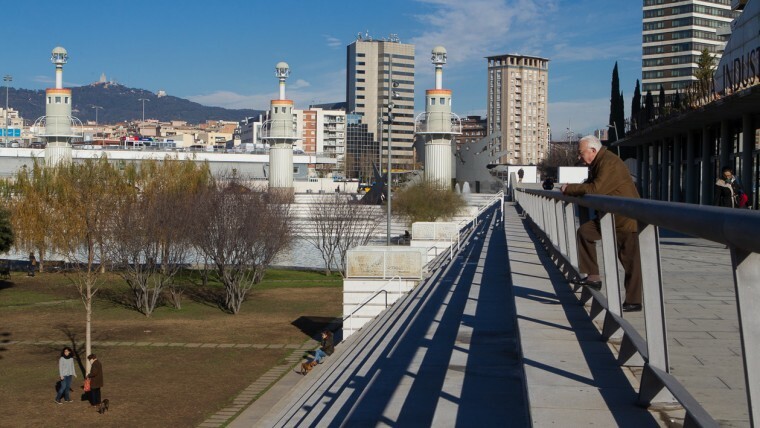 The old industrial complex the park is named after was a textile factory founded by the Muntadas family in 1847 that became Spain’s first cotton company: La España Industrial, Sociedad Anónima Fabril y Mercantil. 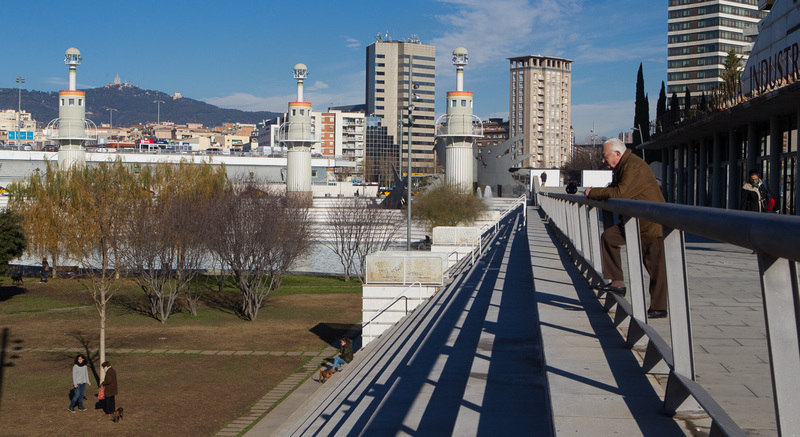 Located at that time in the town of Sants, the factory was popularly known as Vapor Nou (New Steam), in contrast to the name of the other big textile industry there: Vapor Vell (Old Steam). It was always one of the most modern textile factories, dedicated to spinning, weaving and dyeing cotton. In 1880 it employed 2,500 people but in 1969 it closed and the land was sold. Then, in 1985, in response to demands from local residents, the site was allocated for building houses and today’s park. A large sports centre (also known as Espanya Industrial) was built there for the 1992 Olympic Games and held the weightlifting competitions. 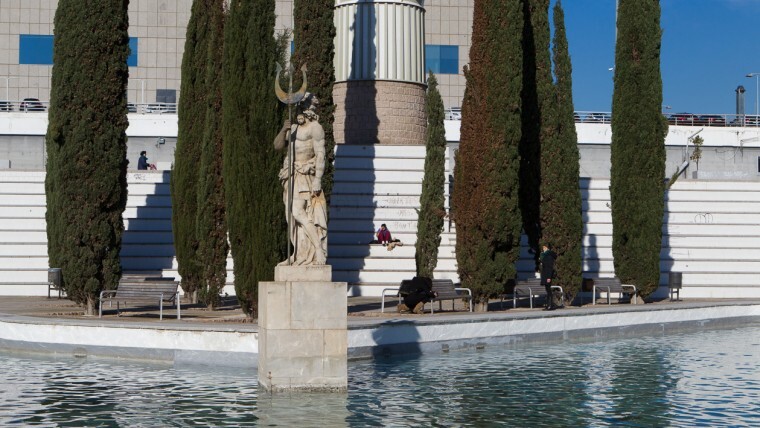 It has since become one of the main sports facilities in the Sants-Montjuïc district. The sheet of water ends at the opening of the branches of several Chinese weeping willows (Salix babylonica), marking out the start of a large, very green expanse of grass, interrupted only by a couple of rows of purple-leaf cherry plum trees (Prunus cerasifera Atropurpurea) that offer a rather lovely reddy contrast. A woody area begins at the far end of this meadow, almost always playing host to sunbathers, that is full of holm oaks (Quercus ilex), Leyland cypresses (Cupressocyparis leylandii), stone pines (Pinus pinea) and plane trees (Platanus x hispanica). The latter species shades the park’s services area, over the summer. The lake contains cypresses (Cupressus sempervirens) that rise up from concrete platforms which occasionally plunge into the sheet of water. It is the city’s second largest lake and it covers an area of some 10,000 m2 . 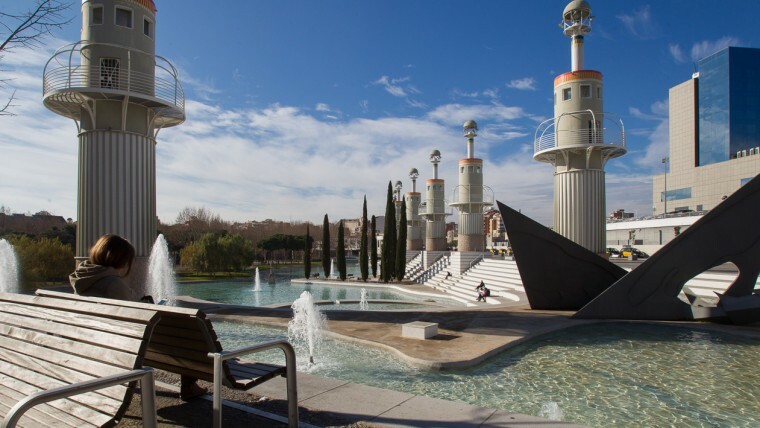 Water recirculation pumps were installed there after redevelopment work finished in December 2009 which enable it to connect with the groundwater grid that comes Parc del Joan Miró. That saves the city 26,000 m3 of drinking water a year. 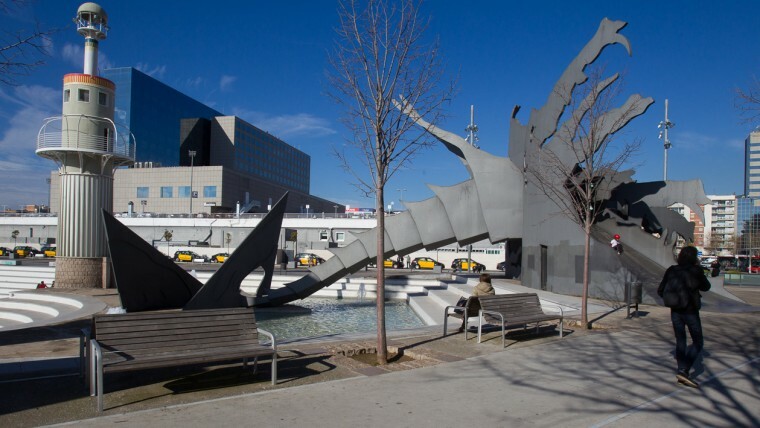 El drac, an immense dragon with open wings and a tail falling into the pool, is by the Basque sculptor Andrés Nagel. Manuel Fluxà’s 1881 sculpture Neptú (Neptune) stands in the water. Venus moderna (Modern Venus) sits on a rock near the lake. This is a sculpture by José Pérez Pérez, “Persejo”, which he made in 1929 for the International Exposition in Barcelona. 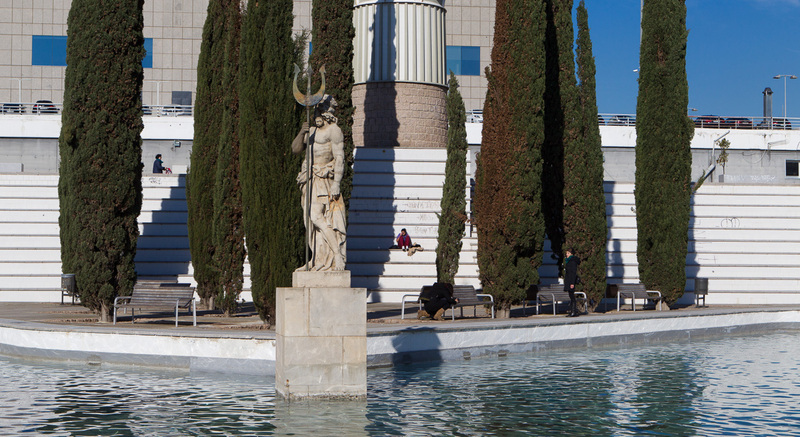 Other works from the first half of the 20th century include Tors de dona (Woman’s Torso), a bronze copy of the sculpted-stone work by Enric Casanoves in 1947, and Bous de l’abundància (Oxen of Abundance), made by Antoni Alsina in 1926. 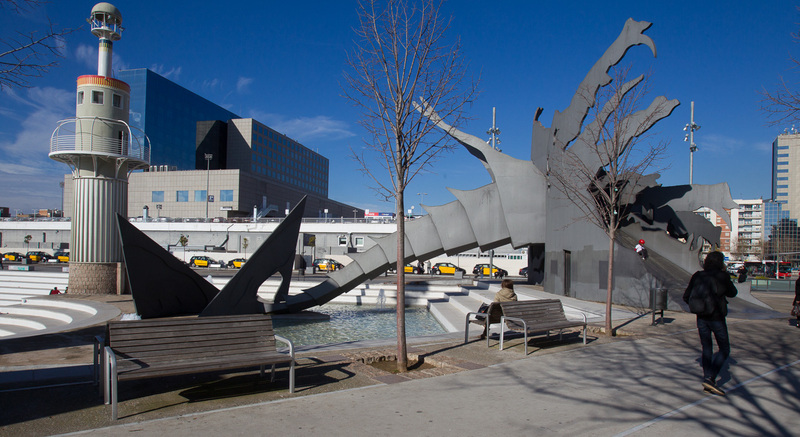 There are a further two sculptures, and very contemporary at that: Landa V(1985) by Pablo Palenzuelo and Alto Rhapsody (1985) by the English sculptor Anthony Caro. 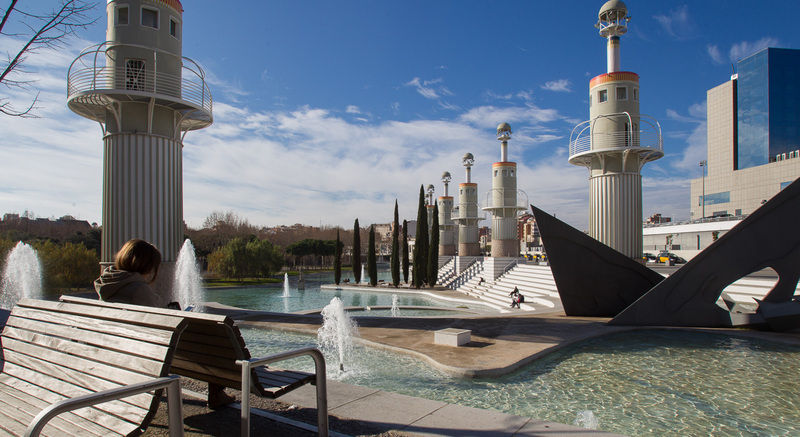 Notable architectural features include nine imposing lighthouse towers created by the architect Luis Peña Ganchegui, who designed the park, and the buildings of the old Espanya Industrial factory that have been preserved, such as the Casa del Mig, now a children’s centre, and the arcade of the entrance gate on C/ Muntadas.